How big is your brand’s social media engagement really? the Campaigning Summit Zürich 2013. I just read this article “What’s A Facebook “Like” Really Worth?” in which the authors suggest a “a new Facebook Likes Per Million (LPM) equatio”. Brand strength has traditionally been measured by the number of consumers actively engaged with a product or service—often requiring marketers to employ costly, complicated analytics. Now there is an alternative. Using a simple formula, you can calculate brand value according to the size of your brand’s Facebook community, adjusted for company size. Simply measuring the total number of Facebook “likes” doesn’t provide a true indicator of your brand’s shape. Larger companies predictably attract more followers simply because of their scale, and that doesn’t tell the whole branding story. To find out the true popularity of a brand, you also need to take into account the size of your company’s revenue stream. In other words, how many brand zealots do you have per million dollars of revenue? At Booz & Company, we developed the Facebook LPM ratio to answer this question. LPM requires two steps. First, tally your total Facebook likes and divide them by your company’s revenue. Then, do the same thing for your competitors to find who is really winning the branding race in your industry. Interesting approach. But it ignores the fact that a page with 100 fans and 3’000 interactions per year (likes, comments, shares) and a large number of page views definitely has a bigger engagement than a page with 1’000 fans and the same number of interactions. The formula therefore should consider the engagement, too, not only the numbers of connections. 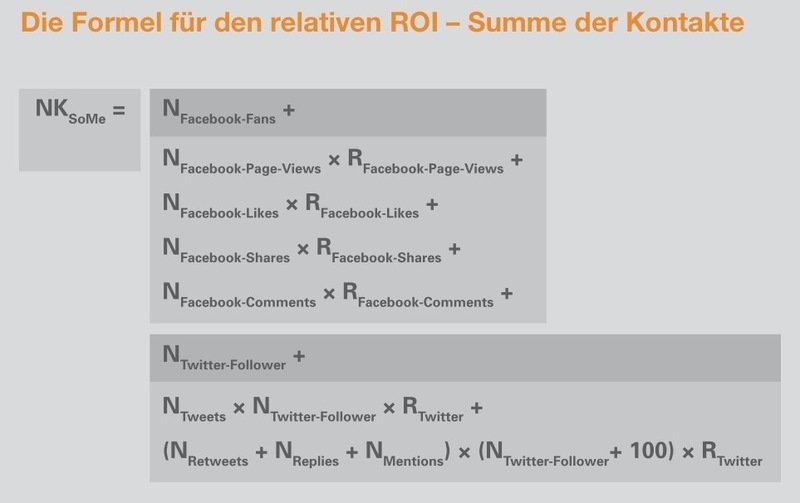 Here comes a formula into play that I developed recently in the context of developing a formula for the relative social media ROI (“Der relative ROI von Social Media“, my latest book; so far only in German). The formula adds the number of connections in a network plus the numbers of different interactions. In the context of ROI not the total number of interactions is of interest but the number of interactions noticed by others, including page views. Only that number gives you an estimate of the number of contacts that you made by posting on your page, or Twitter etc. Not every post and interaction gets seen. The different numbers are therefore multiplied with correction factors (R). If you use that formula instead of simply the number of likes the LPM as mentioned in the article could be changed to a NKPM. And then it could be used to compare different brands on a much better basis. P.S. Campaigning Summit Zürich 2013 – 7th June, with Social Media Campaigning Pioneer Joe Trippi. Let’s meet and discuss.